Okay, remember last week's fast service from Plucky Knitter? The only thing missing from my knitting bag to knit up the Chickadee Cowl was the proper sized needle. Bippedy, boppedy, boo. Fairy Godmother waved her magic wand and made her needles appear on my front doorstep. (Thanks!) Just like magic! The yarn, the needles and my chair kept me entertained Since I didn't make the trek for Harlot's Madison visit. Ta da! Five and a half inches seemed large enough for the cowl...but that meant leftover yarn. No way, with a third of the yarn leftover, another quick cast on and voila! 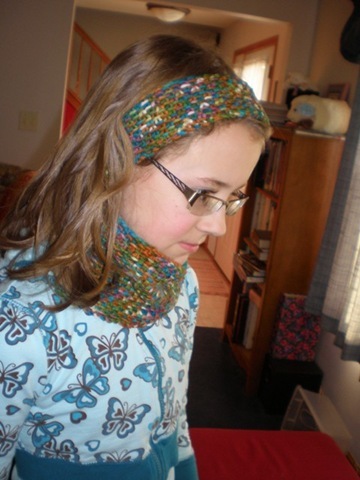 Matching cowl AND headband. Unfortunately, Plucky Knitter is out of Bulky yarn stock. Where could you find me tonight? That's right...trolling the bulky weight yarn on Ravelry to see what else could be knit up. These are not only magically fast, they're magically addictive! The Harlot is in Wisconsin tonight. Sigh. Sometimes life is full of difficult choices. My choices: Take a vacation day on Monday for the Harlot event or Friday for the Pentathlon event. The winner: Friday, for the Pentathlon. The second event for the Sock Knitters Pentathlon begins at 6PM CST on Thursday, May 1. As of this morning, 202 competitors have completed the first pair and I am currently in 5th place. My hope is to print the pattern at 6:00 and knit until it's finished...it'll be a late night! Speaking of battles...there's still time to sign up for Sock Wars III. 4. Receive socks? Bang, you’re dead! The final day for sign-ups is May 3rd. The "killing" begins May 9th. The prizes are cool, but my goal is to make it past Round 1. Are you signed up? Hmmm, how about a little rain instead? They say that April showers bring May flowers. How about torrential downpours? What do 2-4 inches of rain in the span of 90 minutes bring? That's right. 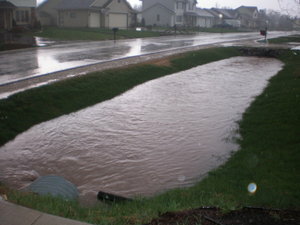 A river; right in my own front yard and it was moving FAST!!! At least with all of this weird weather there isn't an opportunity to get much spring cleaning accomplished outside. What's a girl to do instead? Well, knit, of course! Mystic Light is complete and just in need of blocking. For the time being it rests on my knitting chair as a reminder that it still needs a bit of attention. (Maybe it should go play in the rain.) Does anyone else get "stuck" when it comes time to block your knitting? Mine could languish for days/weeks/months. 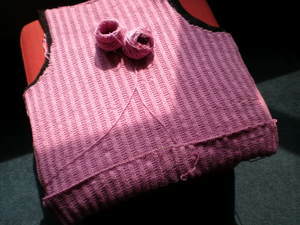 I have several other knit pieces that need blocking as well. Maybe that's why socks are so much fun...limited blocking. No blocking wires, no measuring...just wash and dry, that's it! (Though a pair of these are always nice to have around for the occasion.) 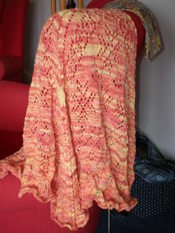 Thankfully, this shawl will be a birthday gift...deadlines always ensure blocking! 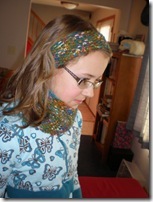 Last week Monday, I was reading Kirsten's blog and was intrigued by her cowl. Tuesday she posted the pattern. That started the ball rolling. 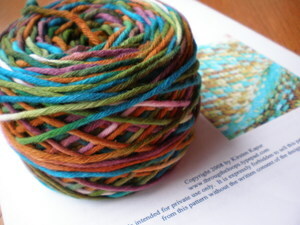 Kirsten had used yarn from another of my blog reads, The Plucky Knitter. 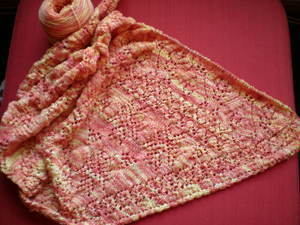 On Thursday, she blogged about Kirsten's cowl and flashed some bulky merino cashmere she had for the pattern. Friday, I broke down and ordered that bulky merino cashmere. Monday it was in my mailbox!!! That was fast, fast, fast. Tuesday I printed off the pattern...a quick knit for sure! With the yarn cake wound, all I needed yet was the needle in order to whip up a new cowl...screech! That's right...fast, fast, fast came to a screeching halt. One day I knew all that sock knitting would get in my way. 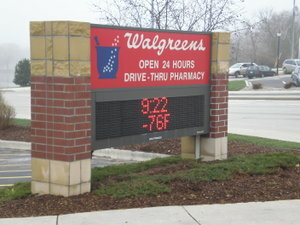 That's right, no 24" needles in US 10 or 10.5!!! No stores in town carry them either. Guess it's time for a roadtrip. If it's not written on my calendar...fat chance if I'll remember it!!! Since it's time to start looking at the summer calendar anyway for the kids, it seemed to be the perfect time to add a few knitting events to the calendar as well! June 14th-Everywhere: World Wide Knit in Public Day I've knit in some interesting places and even Doogie knit "Road Hog Style" but, this year, the hope is to find a bunch of knitters to meet up with for some public knitting. How about you? Do you know what you're doing on June 14th? July 9th- Milwaukee, WI: Stitch N Pitch rolls into my area...how about yours? A little baseball and knitting. 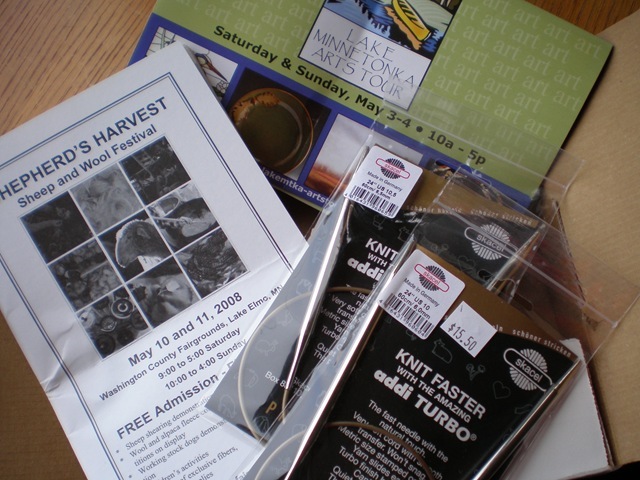 August 16-17th- Allegan, MI: Michigan Fiber Festival Not sure if I'll make it to this one. Then again, I have cousins that live in the area...who knows, hop on the hi-speed ferry...it could happen. August 21-25- Schaumburg, IL: Stitches Midwest We'll be heading to Chi-Town for at least Saturday/Sunday. Shopping and dinner with friends sounds like just the ticket to the perfect weekend. Sept 5-7: Jefferson, WI: WI Sheep & Wool festival We didn't manage to get to it last year, but this year it's on. That's my knitting calendar...there could be more. Want to check to see what's going on in your area? Check the master calendar here. Soon the hillside will have plenty. No one guessed the 22nd, but Nancy had the next closest guess (21st) This weekend I'll put together some spring flowers notecards (Nancy, just let me know your three favorite colors.) 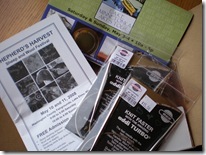 and a fun prize package. Tomorrow the final clue for Mystic Light will be released. It's been a LOT of fun. Anna does such a wonderful job with her designs...and she shares them with all of us. It's been a wonderful journey. As her design has come off my needles, it has not only revealed itself to me, but revealed its recipient. I now know EXACTLY who'll receive the finished project. Just like a daffodil revealing itself, knitting designs are miraculous when they reveal themselves! One at a time. 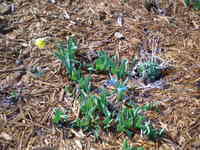 The daffodils haven't bloomed yet. The hillside is beginning to green. But take a good look in the windowsill. 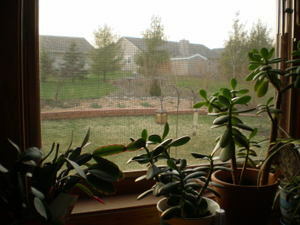 Notice the plant on the left. Look closely. Do you see it there? That's right, my Christmas cactus is blooming! What an unbelievable spring! Maybe I should stop knitting spring projects and go back to knitting Christmas projects. Progress report tomorrow. Sorry to have been so quiet around here...it was Prom weekend here at Chez Krafty1. We were busy preparing food and sleeping arrangements for nine teenaged girls. Our house was home to the "post-prom" festivities, including a sleepover (where there wasn't much sleeping). 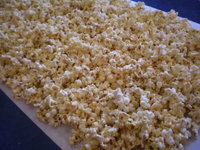 Unfortunately, because the girls got ready at another home for the pre-festivities, there is no picture of Panda...only the batches of caramel corn we prepared. Of course, when you are the parent host of a post party, there isn't much sleep involved. Thankfully, there was a bit of mindless knitting to keep me occupied. (Parents upstairs, teens downstairs.) By 3AM, as things were quieting and they popped in a late night movie...I succumbed to the dulcet tones of Mr. Depp serenade me to dreamland. We were pleased to host them. They were pleased to have a place to hang out and be teens for the night. They all know that they are welcome here. So many of the parents don't want the "hassle" of having the whole group for an evening. We don't mind. In fact, I'd rather they were all here than off trying to find a place to hangout. A little sodapop, a lot of sugar and very little sleep...memories for a lifetime...priceless. I saw a little girl today who reminded me of a long lost habit. She had her thumb near her mouth and would occasionally slip it into the corner and then quickly out again if she thought someone was looking. It reminded me of my own "worst" habit. Though in my case, it was fear of discovery that kept me from EVER doing it in public. Grade school, middle school, & high school sleepover invitations were a nightmare for fear I'd fall asleep and others would discover my secret! Thankfully my thumb's spell has long since been broken. But seeing that little girl made me remember it all. Nowadays, my habits are a bit more mundane: coffee that is ready for me when I wake, toes that lightly wiggle when I sit (or, according to my husband, lie down or stand up), and, of course, there is my daily dose of knitting. Sunday morning coffee while listening to Sherrill's podcast is a newly forming habit. And then of course there is my favorite Habit. Thankfully, today's habits are much better for me both physically and mentally. This week's web links will be brief...I'm been too busy enjoying the nice weather (we've had one day in a row). First, how plugged in are we getting that we are knitting our own privacy shells? Actually, it's Sternlab's project of Body Technology Interfaces. Sternlab is looking for more ideas of things to knit up that show the connection between people and their cells/pdas/other technology. As for this creation, talk about "bag your face"!! Are you a Potter fan? There is word that Opal will have a line of Potter socks in conjuction with the release of next movie. And finally, in case you are frustrated at having to wait for the new yarn release OR if you need from stress relief, what better than to play with some virtual bubble wrap! Ahhhhhhhhh, that's better!